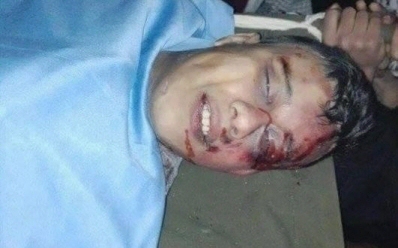 Head of the Prisoners and Ex-Prisoner Affairs, Issa Qaraqe’, on Tuesday, said that Ma’moun Al-Khatib (16), from Al-Doha town in Bethlehem, whose body has been returned on Sunday after three weeks of detention, was beaten to death after being shot.He said that there are marks of torture and savage beating on his body, which is the case of other countless Palestinian victims of the Israeli forces. Speaking at the funeral of 16-year-old Ma’moun Al-Khatib, Qaraqe’ said that even the most fascist countries would not torture their victims even after killing them, torment their families and place restrictions on their burial or funerals, except for Israel. He said, additionally, that the Israeli retention of Palestinians’ bodies after killing them was a shameful moral stigma that challenges all human and religious values. The shooting took place on December 1st, when Israeli forces claimed that the boy tried to stab a soldier on Etzion checkpoint. to the south of Bethlehem. Israel has returned several bodies of slain Palestinians whom they willfully killed over the past few months, and still retains some 50 bodies, refusing to give them back. The bodies are handed back to their families under strict conditions that include time, place, and number of people in the funeral. This move is to prevent taking the victims to anatomy, according to the PNN, since Israel has been accused of harvesting organs and operating other violations on their dead bodies kept in refrigerators.